Preheat the oven to 120C and place serving dishes in the oven to keep warm. Peel the potatoes, cut into chunks, then place in a saucepan with a teaspoon ofcooking salt and enough cold water to cover generously. Bring to the boil and cook for 15 minutes. Peel and seed the pumpkin. Weigh to make sure you have 500g and cut into bite-sized chunks. Place a wok over a high heat and pour in enough hot water to come a third of the way up the sides. Rest a bamboo steamer on top and spread the pumpkin cubes out in it; cover and steam for 10 minutes. Set the pumpkin aside. Meanwhile weigh the parmesan and grate. Check the potatoes are tender with a skewer then drain, return to the saucepan, shake over the heat to dry out and tip into a bowl. In a separate, small bowl, place the flour. Set this aside until needed. Lightly flour the workbench and the baking tray, and have the measured flour close by. Squash the pumpkin and potato through the coarsest disc of the food mill to form a loose mound on the bench. Sprinkle with a good pinch of flaked salt. Sieve most of the flour over the vegetable mound and, quickly but lightly, combine. Knead briefly until the dough is smooth, using a little more flour if necessary. Cut the dough into four pieces and, with your fingers, roll each into a sausage 2-3cm wide. Cut each “sausage” into pieces 2cm long and place on the floured baking tray. Fill a high-sided frying pan with water, add a teaspoon of salt and bring to the boil. Drop in as many gnocchi as will fit easily in a layer. Adjust the heat to a simmer. 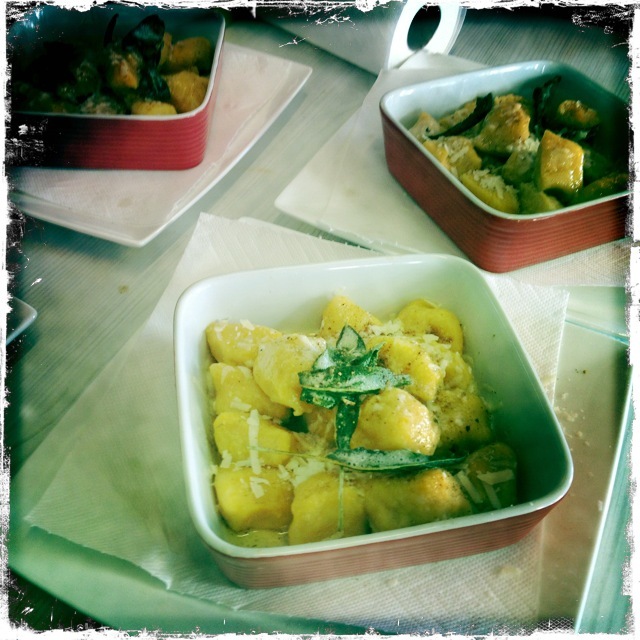 When the gnocchi rise to the surface (about three minutes), lift out with a slotted spoon, drain well and slip into the warmed serving dishes. 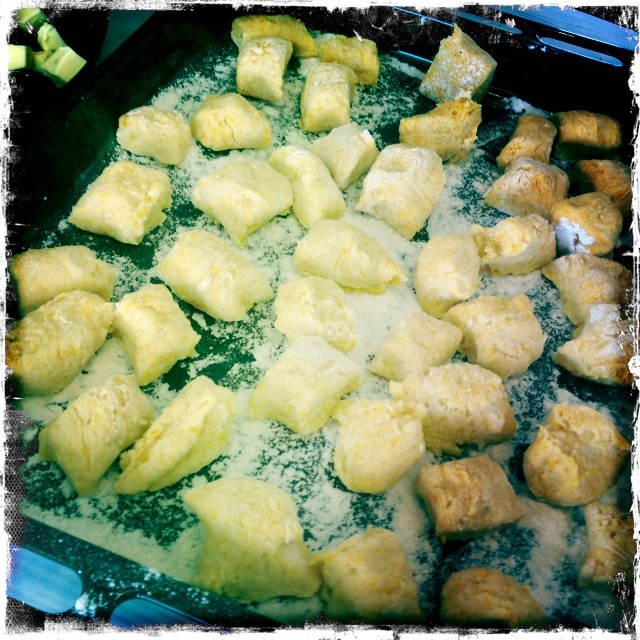 Return to the oven after adding each batch of gnocchi. Scatter over the Parmesan and a sprinkle of nutmeg. Spread the sage leaves in the non-stick frying pan and add the butter. Fry until the leaves are crisp and the butter has become a medium-brown colour. 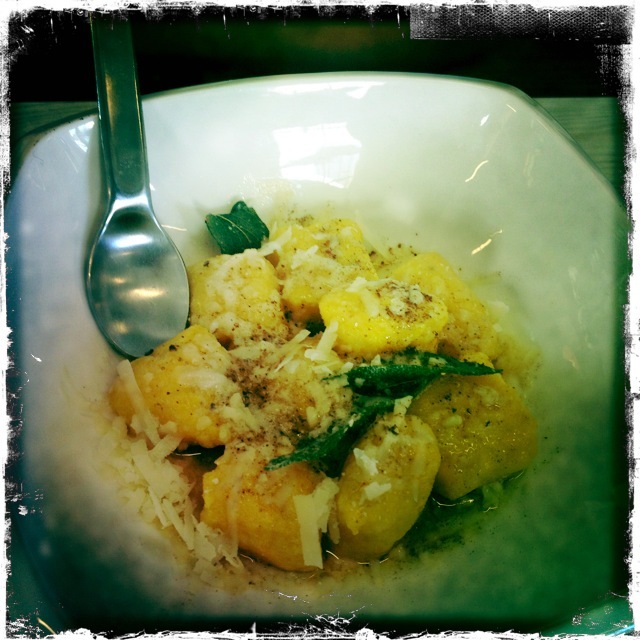 Spoon the sage leaves and butter over the gnocchi in the serving dish and add some ground pepper. Place heatproof mats on the tables and serve the gnocchi in the ovenproof dishes.